This is a Jopling origional we call the Gaff Shot because there is a little bit of trickery involved in making it happen. Place the 5 ball along the foot rail halfway between diamonds 7 and 8. Freeze the 2 ball against the left side rail at diamond No. 7. 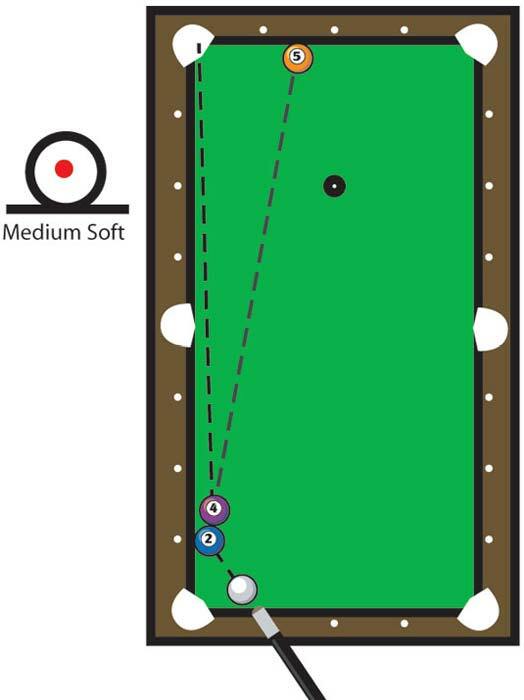 Freeze the 4 to the 2 directly in line with the 5 ball. Tap these balls hard making sure they stay frozen. Pick up the 4 ball and secretly put a pat of chalk on what will become the contact point when you replace the 4 against the 2. Position the cueball directly between diamond No. 6 and the 2 ball. Hit the 2 full in the face with enough speed to sink it in the corner pocket. Watch it twist.